Properties in Fish Camp average 4.6 out of 5 stars. Property 3: Luxury Yosemite Log Cabin ~ 2 Miles to Yosemite Entrance~ Now Booking!! Property 6: Yosemite's Big Rock Cabin - Less Than 2 Miles from the South Gate! 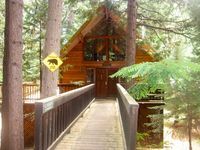 Property 7: Tree Top Cabin - 2 Miles To Yosemite's South Gate! Property 11: Yosemite Silvertip Lodge - Just minutes from the South Entrance! Cozy Yosemite Cabin in the pines, w/ Hot Tub. Property 13: Cozy Yosemite Cabin in the pines, w/ Hot Tub. Sugar Pine Cabin — Minutes from Yosemite's South Entrance & Mariposa Grove! Property 15: Sugar Pine Cabin — Minutes from Yosemite's South Entrance & Mariposa Grove! Property 20: Family Cabin Minutes from Yosemite! Fish Camp Retreat — Large Home Just Minutes from Yosemite's South Entrance! Property 21: Fish Camp Retreat — Large Home Just Minutes from Yosemite's South Entrance! Property 22: Wildflowers and waterfalls abound! Property 25: YOSEMITE Sugar Pine Cabin, 7 Miles To The South Entrance Of The Park. Property 26: "Yosemite's Suite Retreat" Gingerbread Tiny House Perfect for 2! Property 28: Lovers’ Cabin; Gateway to Yosemite National Park and more! Property 40: YOSEMITE CABIN IN HISTORIC SUGAR PINE -7 miles to Yosemite So. Entrance HOT TUB! Valley Oak Bed and Breakfast, enjoy my home away from home Gateway to Yosemite. Property 46: Valley Oak Bed and Breakfast, enjoy my home away from home Gateway to Yosemite. Property 49: Lauri Lane Mountain House - Your Home Away From Home To Visit Yosemite! Our family of four stayed here for a fabulous 5 day get away from the stresses of life. As soon as we drove up to the cabin and then opened the front door, we immediately knew we made the right choice. The cabin is so beautifully decorated, has very comfy furniture, the kitchen had all the comforts of home, laundry area very convenient, beds VERY comfortable, and the ENTIRE cabin spotless! Coming back to the cabin after a long day hiking or touring Yosemite NP was so comforting. We started a fire in the wood burning stove every evening which was such a fun thing for us. The location was FABULOUS for visiting Yosemite. It literally took 10&quot; max to drive to the south entrance. I can't say enough good things about this cabin. The owners were VERY responsive to all our questions before we arrived. We honestly never had to even contact them once we arrived because we had ZERO questions/problems. We received our deposit back within 7 days. Yosemite and this cabin made for the best family vacation we have ever had. Definitely hoping to return to Yosemite and this cabin in the future.